Igingerly entered the Shrine Room of the Bhavana monastery as the monks took their places on the floor in front of the statue of Buddha. The porcelain likeness of the sage sat frozen for eternity in the lotus position, its drooping eyelids and dreamy smile softly glowing in the candlelight. I placed a small cushion near the back row and delicately sat on it. I waited. All stirrings ceased as a dark-skinned monk at the front of the room tapped a small gong, then uttered a brief prayer in the ancient language of Pali. Silence. Only the faint sounds outside. The rustling wind through the trees. The far-off bark of a dog. An absolute and impermeable stillness settled in the room, which would last for one hour, as silent meditation was practiced. The Bhavana Society Center sits placidly among the birches and cedars of the western West Virginia woods, near the town of High View. I had come there for three days of retreat, more out of longstanding curiosity than pilgrimage—to experience for a spell the monastic life, free of telephone calls, traffic jams and TV commercials. I arrived on a brisk, cool day. A gaunt, pale-skinned woman wearing the traditional saffron robes of the Buddhist clergy greeted me. She introduced herself as Sister Sama. Her shaved head bowed forward as she spoke. She led me down a path to a small cottage, one of the five single-room guest houses, or kutis, constructed by the Bhavana Society for visitors on retreat. Damp leaves completely covered the ground. It had rained earlier, and the air was wet and fresh. Sister Sama dropped the door key in my hand. I went inside. The kuti was simple and spare: a foam cushion atop a sheet of raised plywood for a bed, a simple table and chair, an oil lamp and candles, and the single luxury item—a kerosene heater. Three big windows framed the surrounding woodland. I tossed my sleeping bag into a corner and dropped my books on the table. During the daylight hours, mostly I walked, read or just daydreamed. By night, I wrote in my journal and studied spiritual books in the warm yellow light of the oil lamp. I grew to love its dim, natural glow, though it barely matched the illumination of a 25-watt bulb; I relished the spooky shadows it cast on the wooden planked walls. One afternoon, Bhante Gunaratana, the abbot, called me to his office. Bhante is a small, pudgy Sri Lankan with a cherub face. He founded the Bhavana Society in 1986. 1 took a chair in front of his desk. “Do you have questions,” Bhante asked. “I read some of the books on Buddhism,” I said. The center’s library was well-stocked. “And?” His luminous eyes didn’t blink. I thought about it. Attachments, addictions. How much is enough? And what defines enough? How much money, how many friends, how much recognition, how many memberships? So few people feel they have enough of what they think they want. Maybe we can never satisfy our need for possessions. Maybe materialism by nature engenders a never-ending hunger for more, more, more in a perpetual cycle of desire and fulfillment. Witness the monumental greed of today’s business stars and celebrities. The Buddha said the more energy you put into the worldly hungers, the more enmeshed you are in their powerful and addictive grip. But the Buddha decried passion, too, something dear to many of us. Passion is the fountainhead of creative and idealistic pursuit. No passion? What of love? Passion gives us dance, song, art, music. It’s the fuel of creation; it brings out our best. And our worst. The dark underside of passion is hate, greed, bigotry, war. Passion misdirected. 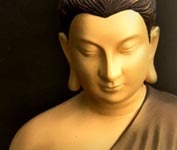 Was the Buddha right—is the solution to our problems to detach from passion? I couldn’t say. The morning I left the retreat center an icy chill permeated the woods, but the sun was bright. I was eager to return to my friends and familiar values, however high the cost of addictions. I had temporarily dropped old habits. During my brief stay, I consumed no coffee, sugar or meat, nor did I yearn for these substances after the first day. But now I found myself urgently turning the wheels of my car into the parking lot of a roadside diner. Inside, I ordered coffee and a wedge of pecan pie. I picked up a newspaper. The hot elixir soothed me, and I felt as though I had come home from a long journey. What remained now was to go dancing. I wasn’t sure why.